Indianapolis' currently under construction Lucas Oil Stadium will be the future home of the Drum Corps International World Championships for 10 years starting in 2008. 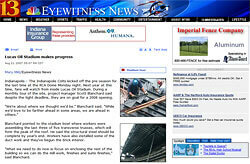 The Indianapolis NBC affiliate, Channel 13, recently reported that despite the tight deadlines that construction crews are working under, they are on goal for a 2008 opening of the stadium. The 2008 Drum Corps International World Championships, scheduled for Aug. 5-9, will be the very first set of events held in the state-of-the-art stadium. Read the article on WTHR.com. Drum Corps International officials toured the Lucas Oil Stadium construction site on July 28. 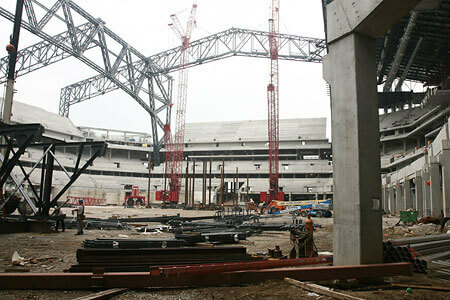 View the day-to-day construction progress of Lucas Oil Stadium.